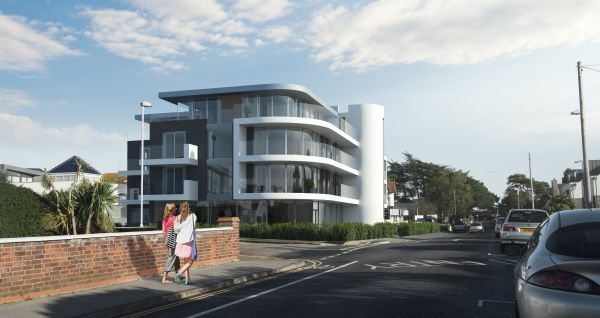 Borough of Poole: Pure Town Planning are delighted to have recently obtained planning permission for a four-storey building consisting of 12 luxury apartments and a car showroom at Panorama Road in the prestigious Sandbanks area of Poole. The scheme was designed by architects Anders Roberts Cheer. 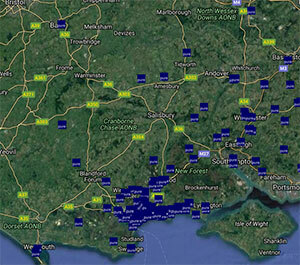 Another issue that had to be managed was that the site lies in a future flood zone. This meant the development had to be designed to be above the predicted future flood levels for the lifetime of the building. Despite highways and flooding issues being dealt with, the Planning Officer had two outstanding concerns that ultimately led to his recommendation for refusal. Not deterred by this, we asked for the application to be taken before the Planning Committee to allow an opportunity for the merits of the application to be heard. The first concern was the 4th storey, which the Case Officer considered too large, and that 3 storeys was of a more appropriate height. At Planning Committee, we argued that with a recessed fourth storey the building would be read as three storeys from the streetscene. Further to this, we undertook a contextual appraisal of the area, which showed to Members that the emerging character of the locality was taller buildings. The second issue raised by the Case Officer was the principle of flats on this site. The Case Officer argued that the area was primarily detached houses and thus flats was out of keeping. Again an appraisal of the surrounding area was undertaken which showed that the predominant form of development on the northern side of Panorama Road was in fact flats not detached dwellings as the Case Officer had asserted. With Matt providing this information to the Committee Members in a clear and concise manner, they approved the application against Case Officers recommendation for refusal. Therefore, if you have a site where you are looking to extract the maximum value from and want a company that can give you the best chance of doing this, why not give Pure Town Planning a call on 01202 585524 or email at info@puretownplanning.co.uk for a FREE 30 minute consultation.